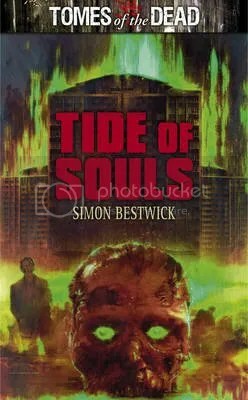 It was about 5 years ago when I first read a story by Simon Bestwick, and at the time I had no idea what I was in for. That story was “The Narrows”, a truly immersive experience with genuine chills and aching pathos, so the bar was set absurdly high from day one. But over the last few years of reading his fiction, I’ve discovered that this wasn’t a chance one-off and this exceptional collection of six novellas from Gray Friar Press proves that he’s one of the strongest voices in contemporary British horror. First up, “Dark Earth” tackles the brutality of the First World War, colloquially regaled by Private Bill Sadler who’s under court martial for desertion. This grim and bloody period of history is compounded by the infestation of no man’s land with mud-dwelling, toothy worm-like monsters that devour and possess the frontline soldiers, and possibly have influence even further up the ranks. I was completely absorbed into the death and desperation, and believable characters inject real humanity into the story. It’s also pleasing – and respectful – that the monstrous elements don’t detract from the real horror of trench warfare, instead combining the two to create a powerful and action-packed adventure that forms a sterling start to the book. Next up is the aforementioned “The Narrows”. Gripping from the off, it’s the present tense account of Paul, a secondary school teacher during a nuclear holocaust. Having survived the initial blast, he somewhat unwillingly leads a small group of surviving children and fellow staff underground to avoid the radioactive fallout. They find refuge in a network of subterranean canals and caverns known as the Narrows, but something malevolent seems to be down there with them. Or is it the actual tunnels themselves? Or even a creeping madness from the radiation? A deeply moving piece, we feel our protagonist’s pain, knowing that his girlfriend has inevitably perished in the blast, as have the others’ families and loved ones, and that combines with the relentless claustrophobia to form a very memorable experience. It cranks up the hopelessness of their situation, turning down the lights until there’s nothing left and you have no choice but to join them in the descent. A superbly evocative piece and a deserved addition to one of Ellen Datlow’s best-of horror anthologies. Following this classic is “A Kiss of Old Thorns” which introduces Andrew, a young man out of his depth and on the run with a tough bunch of bank robbers. After a car accident on an isolated road, they seek sanctuary in the beachside home of an old hermit who fashions wreaths from thorns in order to keep some kind of supernatural evil at bay. A tight story peopled by some believable and nasty characters, there’s plenty of menace from both the baleful presence and the thugs themselves, and I was very much along for the ride. “The Model” sees Ella – a cash-strapped student in Salford – answering a call to be a life model. But rather than an art class, she’s unnerved to discover it’s one hulking, almost-unseen man in a quiet empty building that also seems haunted by strange wraith-like presences. After repeated visits, she becomes increasingly ill and afraid, but is drawn by the money and more importantly, some kind of sinister hold that the artist seems to possess over her. She is unable to resist his call, even after a suspicious death, which is made more chilling by her being quite a sensible girl. While the finale is appropriately bleak, it is somewhat less concrete than I would’ve liked, but there’s tremendous sense of place, as always, and the story oozes a grim inevitability. Despite not thinking that “The Narrows” could be topped, I found “The School House” to be The Condemned‘s crowning glory, blindsiding me with incredible emotional and physical clout. We are introduced to Danny, a man who works at a psychiatric home and is plunged into the past after a childhood friend is committed for burning down their old school. Danny soon starts to have nightmares that resurrect suppressed memories of bullying and violence, and he begins to wonder if he’s losing his sanity. I don’t want to give too much away, but with its themes of control, power and broken minds, this story blew me away. There are some real surprises and twists in store – both brutal and genuinely heartbreaking – proving that this author is an intelligent, reflective writer at the very top of his game. This is a horribly unputdownable piece of work, full of dextrous literary tricks and tragic, terrifying portrayals of both mental illness and our darkest natures. Brace yourself and be damned. Finally, the scene is one of urban deprivation for “Sleep Now in the Fire”. Our unwitting hero is Sean, an ordinary man visiting a block of flats in a sinkhole estate to look for his missing brother. He bumps into a surprisingly pleasant young woman, but this reassurance is soon soured by the appearance of a local nasty piece of work who might be behind his brother’s disappearance. After his car is stolen, Sean finds himself trapped in the squalid streets and beset by some taloned vampiric creatures called the Blueboys. This piece begins brilliantly with a palpable sense of threat, plenty of twisting action, and the author builds you up and knocks you down emotionally in subtle ways. It’s not without flaws, however. I found the political metaphors a bit clunky and the potential romance angle didn’t quite work for me. The science of the Blueboys seemed a bit complicated and took some explaining, and occasional segments of dialogue are a bit cheesy, robbing the grittiness of the outset: is this meant to be social realism or just fun? But these gripes are not so important in such a rollercoaster of a tale, and the scene is set for a showdown of fireworks and blood. There’s a soul-restoring fightback of good versus evil, and an epilogue that concludes both the story and the collection itself on a refreshingly positive note. I very much enjoyed The Condemned. With brief and revealing story notes, there’s not a bad tale to be found, and this deep but never turgid book is more than worth the cover price for “The Narrows” and “The School House” alone. Simon Bestwick’s prose is sharp and the investable protagonists bring life and humanity to every piece. He can turn his hand to all elements of modern horror fiction whether eerie or shocking, supernatural or earthly, and even when he just sets out to entertain, thoughts are always provoked. If you’re familiar with this author, then you can look forward to enjoying some of his finest work. If not, then The Condemned is a grand place to start. Rarely is the macabre so satisfying.